The 8th International Conference Dispersion Analysis & Materials Testing is hosted by LUM GmbH in Berlin, Germany, from 29-30 January 2018. Here, during this now traditional interdisciplinary event, particle scientists meet product formulators; application engineers meet scholars from extremely different application areas. All have in common the use of STEP-Technology® for particle and dispersion characterization respectively the use of CAT-Technology® for the timesaving determination of adhesion forces and composite strength. Both technologies developed by LUM. Once again, one highlight of the event will be the session dedicated to Young Scientist Award 2018. This prize is donated by LUM GmbH for outstanding scientific achievements in the fields of particle and dispersion analysis and materials testing. From all applicants the best four candidates were nominated and invited to discuss their results during the conference. Sophie Kühne from TU Bergakademie Freiberg (Germany) reports on the agglomeration behavior of emulsion-slurries (suspensions, which contain, apart from a disperse solid phase, also a disperse liquid phase) before and after Cake. This work has significant influence on the processing of e.g. Pickering emulsions or oil sands. Yong-zhu Wen of the global company Master Kong Co. Ltd, Shanghai, China, presents his results on the prediction of the oil slick flotation in fruit drinks by instrumental analysis. The aim of this project is to predict and improve the oil slick flotation in juice beverage and optimize product formulation by taking the shortest possible time. Georg Surber (Technical University Dresden) investigates exopolysaccharides in fermented dairy products (e. g. yoghurt, fresh cheese) and their effects on the sedimentation behaviour during manufacture and storage. 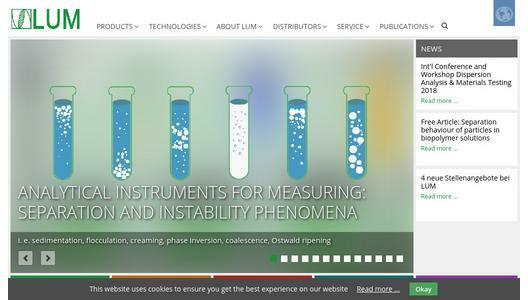 This reflects a further important application area in food industries for analytical instruments made by LUM. The evaluation of analytical centrifugation performance (LUMiSizer®) for the particle size analysis of real-world materials is in the focus of the contribution by Christian Ullmann of Technical University Dresden, Germany. The results highlight the potentials of this method for nanoparticle characterization in comparison to other techniques, too.